We're living in the golden age of cheese. Just as California wine and beer rose from forgettable mass-produced plonk and suds into fine beverages that can compete on a world stage, artisinal, hand-crafted cheese from Marin and Sonoma counties has established the area as one of America's premier cheese regions. 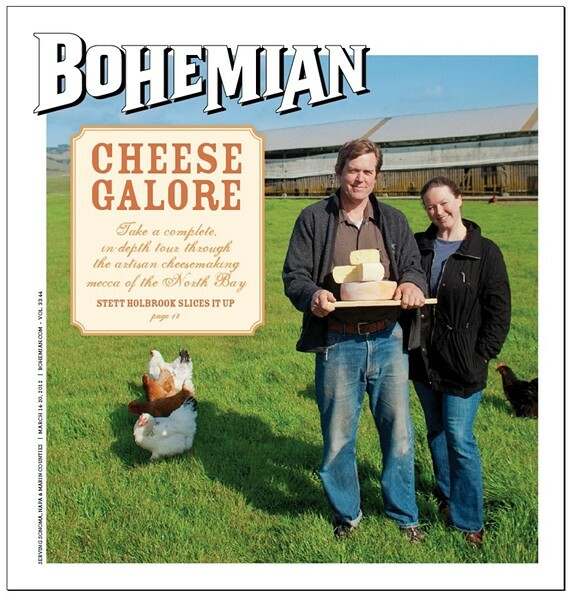 There are now more than two dozen North Bay cheesemakers and two cheese festivals. The grassy hills of western Sonoma and Marin counties have been home to herds of dairy cattle and dairies since the mid-19th century. Swiss-Italian and Irish immigrants lured to the San Francisco Bay Area during the Gold Rush knew they had found something special when they gazed upon the sparsely forested green hills around Petaluma, Marshall and Tomales. Cool, foggy weather and abundant water meant grass grew nearly year-round, perfect for the dairy cattle that would produce thousands of gallons of milk and tons of butter for the burgeoning city of San Francisco and for California at large. Even before the construction of the Golden Gate Bridge, West Marin dairymen would ship their milk and butter out of the Petaluma River and Tomales and Drake's bays into nearby San Francisco harbors. But in spite of all that milk being produced, there wasn't much cheese. Petaluma's Marin French Cheese Co. dates back to 1865 and is America's oldest cheesemaker, but few others followed suit. America was not a cheese-eating country—at least not of very good cheese. Commodity cheese—big blocks of cheddar, jack and rubbery mozzarella—ruled the land, and all those other fancy cheeses came from across the Atlantic. Of course, there were notable exceptions. Sonoma's Vella Cheese Co. opened in 1931. Matos Cheese Factory, Laura Chenel and Redwood Hill came much later, and were part of the first wave of artisinal cheeses. But over the past 15 years, a new era has begun, thanks to a combination of a few key personalities, a rich dairy history, wise land-use policies and a shift in America's culinary Zeitgeist. 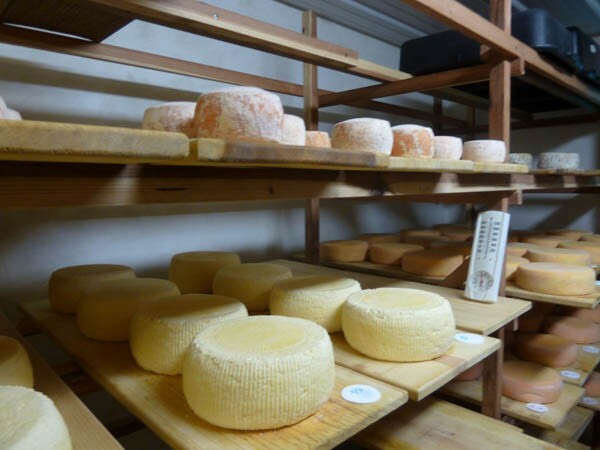 The cheese aging room at Weirauch Farm and Creamery was once a portable classroom. Sue Conley's timing was impeccable. As cofounder in 1997 of Cowgirl Creamery, one of the first local cheesemakers to hit the big time, she and her partner, college friend Peggy Smith, have been instrumental in the North Bay's cheese revolution. But she didn't set out to be a cheesemaker. Conley was a cook who helped start Berkeley's beloved Bette's Oceanview Diner. Smith was a chef at Chez Panisse. Both had traveled to Europe and were smitten by the regional food there. Back in the Bay Area, Chez Panisse exerted a powerful influence on cooks and diners alike, who began to embrace what was then a novel concept: eating fresh, seasonal food from local farmers and purveyors. "This was in the air," says Conley, a beaming, rosy-cheeked woman. "This was the time." Conley fell in love with a park ranger who worked at the Pt. Reyes National Seashore, and in 1989 bought a house in Point Reyes Station. "That," she says now, "was really a great move." It also proved to be a great move for the future of local agriculture and the incipient artisan cheese movement. One day Ellen Straus knocked on her door in support of a candidate running for office. Straus, who died in 2002, was married to dairy farmer Bill Straus. Their son Albert was in the process of converting the family dairy to organic methods, making it the first organic dairy west of the Mississippi River. Straus was also a cofounder of the Marin Agricultural Land Trust (MALT), a nonprofit organization dedicated to permanently preserving farmland in West Marin. (Disclosure: my wife works for MALT). Conley had read about Straus in John Hart's book Farming on the Edge. "I thought it was so cool she was in my house," she remembers. Straus told Conley about the things her son Albert was up to and about MALT's work, making the point that it wasn't enough to protect local farms from development; it was critical to find new ways to keep these farms financially viable. Preserving farms and ranches was no good if the farmers couldn't make a living. Filled with her local-food consciousness, Conley got an idea: she would borrow a concept long used in France, and bring regional foods under one tent for ease of promotion. "I thought I could be a marketer for local products," she says. "Otherwise, these farms would be gone." But back then, there simply weren't many products to market. There was the oyster industry, the milk industry . . . And that was about it. She figured marketing shellfish would be a hassle, and there was no reason to market commodity milk, which is what most Marin County milk was. So the first products she represented were Straus Family Creamery's organic milk, and cheese from some of the only local producers out there: Matos Cheese Factory, Santa Rosa's old-school maker of Portuguese-style St. George cheese; Sebastopol's Redwood Hill, a goat cheese producer; and Bellwether Farms, a pioneering sheep's milk cheese company in Valley Ford. She called her fledgling marketing and distribution company Tomales Bay Foods. Conley spotted a barn for sale in downtown Pt. Reyes Station and bought it after selling her share of Bette's Oceanview Diner. She called her old friend Peggy Smith and asked if she wanted to join her in her new venture. Conley's idea was to turn the barn into a place for "3-D" marketing where customers could see and taste the foods from the region. And she had another marketing idea: why not make some cheese of her own, right there in the barn, so people could see how cheese was made? And thus Cowgirl Creamery was born. "We never meant to be great cheesemakers," Conley says. As a former cook, Conley figured she could make cheese—and by her admission, she made pretty good cheese—but she later hired more experienced cheesemakers who helped create the company's now famous Mt. Tam and Red Hawk cheeses, all made from Straus milk. Other cheeses followed. The cheese was a hit, and Cowgirl opened a 400-square-foot shop on Fillmore and California in San Francisco. They soon outgrew it. In another stroke of good timing, the San Francisco Ferry Plaza was undergoing a remodel and looking for a lineup of premium local food purveyors. The local food movement was coming of age. Cowgirl Creamery was right in the middle of it all. It took Conley and Smith eight years to make a profit, but in addition to stores in Pt. Reyes Station and San Francisco, there's now a Cowgirl shop in Washington, D.C. Between 1997 and 2006, all their fresh cheeses won first prizes at the American Cheese Society's annual competition. Tomales Bay Foods now represents about 60 cheesemakers. And in addition to her work at Cowgirl and Tomales Bay Foods, Conley chairs MALT's board of directors. Cowgirl, now in its 15th year, shares its knowledge with new cheesemakers and currently produces about 156,000 pounds of cheese annually, infinitesimal by industrial cheese standards, but not too bad for an accidental cheese company in West Marin. "Cowgirl was really the catalyst," says Lynn Giacomini Stray, marketing director for Point Reyes Farmstead Cheese Company, the wildly successful maker of Point Reyes blue cheese. Giacomini Stray, who also serves on MALT's board, is one of Marshall dairyman Bob Giacomini's four daughters. The elder Giacomini is one of West Marin's most successful dairy farmers and served as president of the National Dairy Board. It's a business he learned from his father. A little over 12 years ago, Bob Giacomini called the family together to talk about the future of their 700-acre ranch and herd of 500 cows. While milk prices were holding steady, the cost of production was going up. Plus, 500 head of cattle was having an environmental impact on Tomales Bay, below the hilltop ranch. Giacomini's daughters had all moved away from the area, and there was no one in line to take over the family business. "We knew we had to do something," remembers Giacomini Stray. Bob Giacomini never liked seeing the milk trucks pull up at his ranch and leave for places unknown. "He really wanted a finished product that he could say 'This is what we did with our milk,'" Giacomini Stray says. So why not make cheese? Better yet, why not make blue cheese? At the time, the only other nationally known producer of blue cheese was Maytag Blue. With a herd of their own, and with Cowgirl's example to inspire them, they got into the cheese business and reduced the size of their herd by 200. "I said, 'I'll come home for that,'" says Giacomini Stray.